Listeners tuned into 92.7 Mix FM could not see the emotion, but they could hear it in Caroline Hutchinson’s voice as she realised sick Coast children will be given a fighting chance. 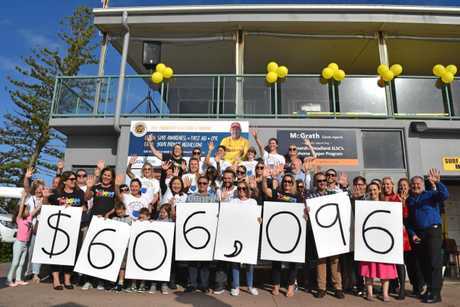 A teary Caroline, alongside co-host Mark Darin, looked up to the Alex Surf Club’s balcony to find the breakfast hosts had smashed their $600,000 fundraising goal towards Give Me 5 For Kids. 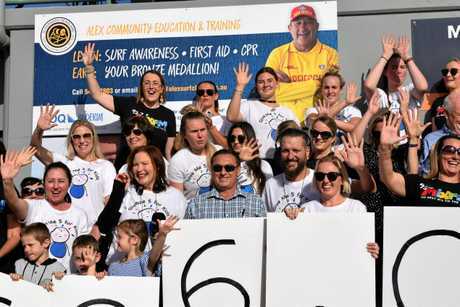 Caroline set the target which brings the Mix FM team’s total contribution to $5 million over the near 20 years the charity has run on the Sunshine Coast. The pair explained this money will go towards accommodation close to the Sunshine Coast University Hospital to keep patients and their families close together during treatment. “We are looking for land and this is enough to say ‘let’s go, let’s get it started, let’s have another house on the Coast’,” Caroline said. It will also go towards medical equipment including a video larygoscope; a potentially lifesaving type of intubation for newborns with respiratory failure. Taking a brief moment off air, Mark said he and Caroline had run fundraising events every day throughout June and that seven businesses did the “heavy lifting” with contributions of more than $25,000 each. “It really is everything from two bucks of Tooth Fairy money to $800 worth of travel raffle tickets that someone bought,” Caroline said, with Mark adding a “remarkable” $15,000 was raised this morning alone. “We are an amazing community, I know that people trust Give Me 5 For Kids because we go to the hospital, that’s the place that everyone ends up eventually, you know,” Caroline said. “You have a sick kid or grandchild or even a sick friend and you end up there and you see the difference that this money makes to really sick kids and their families. “And that’s why people give, because they know it is going to the right place. STORY BY THE SUNSHINE COAST DAILY – July 6, 2018.